US Civil Servants Instructed Not to Use the Term "Climate Change"
A new atlas by Guerrilla Cartography explores the importance of water in everything from ancient mythology to modern warfare. Maps in the world atlas come from artists, activists, academics, and other mapmakers. The group’s project, Water: An Atlas, takes an unconventional look at the importance of water through more than 80 maps, including one showing the sites where water has played a role in conflict with ISIS. The project is reviewed in some detail by National Geographic here. Stratfor Worldview, an online publication of American geopolitical intelligence platform Stratfor has, August 11th, produced a review of the Iraqi water crisis from a US security perspective including the Tigris-Euphrates basin, the importance of Mosul and the Mosul Dam risk, scarcity risk for Fallujah and Ramadi, transnational tensions with Turkey and Iran and an overview of past policy mistakes. A new book, Water, Security and US Foreign Policy has been produced by WWF-US. New Security Beat has produced a summary of the chapter focusing on challenges for a water-secure Pakistan. One of the biggest water challenges for Pakistan is the fact that none of its freshwater sources originate within its own boundaries. Climate change and societal challenges are analyzed along with implications for US foreign policy and recommendations for US priorities. US Secretary of State Rex Tillerson has directed that the country’s diplomats “sidestep questions from foreign governments on what it would take for the Trump administration to re-engage in the global Paris climate agreement”, The Guardian reports. A cable, sent by Tillerson to embassies earlier this month, also said diplomats should make clear that the United States wants to help other countries use fossil fuels. Diplomats are told to expect foreign government representatives to ask questions like: “Does the United States have a climate change policy?” and “Is the administration advocating the use of fossil fuels over renewable energy?” The Trump Administration’s instruction to diplomats is that their answers should be vague and evasive. Staff at the US Department of Agriculture (USDA), meanwhile, have been told to avoid using the term climate change in their work, with the officials instructed to reference “weather extremes” instead according to a separate Guardian story (August 7th). Bianca Moebius-Clune, director of soil health at USDA, has issued instructions re terms that should be avoided by staff and those that should replace them. “Climate change” is in the “avoid” category, to be replaced by “weather extremes”. Instead of “climate change adaption”, staff are asked to use “resilience to weather extremes”. On August 24th the UK paper carried an op-ed piece by Peter Gleick, president-emeritus of the Pacific Institute think-tank headlined Poison once flowed in America's waters. With Trump, it might again. Gleick is particularly critical about apparent efforts by the Trump Administration’s USEPA to dismantle key elements of the country’s 1972 Clean Water Act. Meantime, USA Today and multiple other outlets report that up to 63 million people — nearly a fifth of the United States population — from rural central California to the boroughs of New York City, were exposed to potentially unsafe water more than once during the past decade, according to a News21 investigation of 680,000 water quality and monitoring violations from the United States Environmental Protection Agency (USEPA). Findings highlight how six decades of industrial dumping, farming pollution, and water plant and distribution pipe deterioration have taken a toll on the country’s local water systems. Decision time is approaching for the regional agencies that would have to pick up the nearly $17 billion USD tab for building two massive, long-planned water tunnels in California under the Sacramento-San Joaquin Delta, the heart of the state’s water works (Los Angeles Times). In Colorado, Summit Daily reports that the estimated cost for implementation of the state’s water plan have doubled from $20 billion USD to $40 Billion USD raising questions about where funding will come from. Mexican and American officials are finalizing a water-sharing deal for the Colorado River, and a newly released summary of the accord’s key points shows negotiators have agreed on a cooperative approach geared toward boosting reservoir levels and trying to stave off a severe shortage (USA Today). The document, which federal officials have circulated among water agencies, outlines a series of joint measures that build on the current 5-year agreement, which expires at the end of this year. Four judges in two Michigan counties have recused themselves from hearing the Nestle Waters North America appeal of a local zoning case (mlive.com). The Michigan Department of Environmental Quality is reviewing Nestle's application to boost pumping on its well in Osceola Township. The controversial application has generated significant opposition from the public and Michigan tribes. Local lawmakers this week asked for a criminal investigation into the discharge of wastewater that turned the water below Niagara Falls black (Wood TV). Legislators want agencies to probe the July 29 discharge that turned the water near the base of the falls black on a sunny day when the area was crowded with tourists. The Niagara Falls Water Board says workers at the local wastewater treatment plant let a pump run for too long while emptying a sedimentation basin. New York state officials say a second more recent discharge near Niagara Falls is believed to be a rain-related sewer overflow and unrelated to the previous release (The Sacramento Bee). Climate activist and former Vice-President of the United States Al Gore got caught out by the weather at a Miami Beach screening of his new documentary “An Inconvenient Sequel: Truth to Power,” (Miami Herald). The film about global warming features Gore on-screen wading in rain boots through the water on a flooded Miami Beach street, and saying that Miami is the No. 1 city in the world for assets at risk due to sea level rise. Surreally when the movie screening ended, “the entire area was flooded and nobody could get out of the building”. Miami Beach stormwater pumps had failed to work because of a power outage caused by heavy storm. 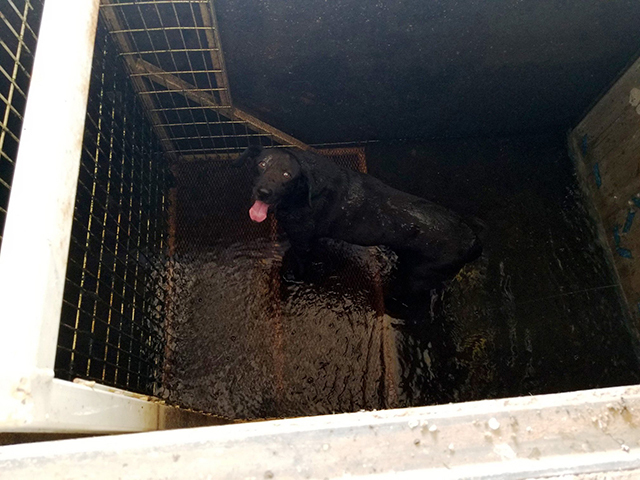 A Stillwater, Oklahoma dog was rescued after being found swimming in a wastewater treatment plant, reports KJRH in Tulsa. According to the City of Stillwater, the pooch was found swimming in a clean water basin at the plant last week. The adventurous pup was returned home to his family who, in a photograph posted on Facebook, looks happy, normal and, well, dog-like. It could have been worse. New Delhi TV reports this week that photos of stray dogs from Navi Mumbai's Taloja Industrial Area, Mumbai, are a hit on social media because of their spectacular bright blue color. The change in color is reportedly due to untreated coloring dyes being discharged into the nearby Kasadi river. Local canines often wade into the river to drink water and are exposed to the chemicals. This video is worth a look. Good news – subsequent rains seem to have washed the dogs down to their natural, more dog-like coloring.